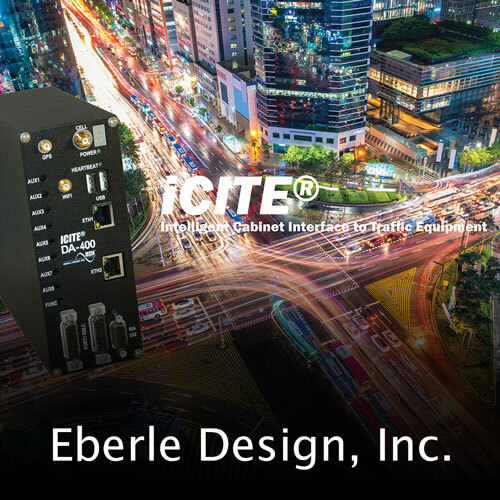 Eberle Design Inc. will be featuring the latest addition from its Intelligent Cabinet Interface to Traffic Equipment (iCITE®) suite of products, the new iCITE® Data Aggregator DA-400x™. The iCITE® Data Aggregator DA-400x™ transforms legacy or isolated traffic cabinets into real-time traffic data reporting and count stations, allowing users to safely and cost-effectively retrieve real-time, critical intersection data. One of the most critical needs for many traffic management agencies, companies and researchers attending the IRF R2T Conference & Expo is access to accurate intersection and arterial traffic data. The iCITE® Data Aggregator DA-400x™ is invaluable to providers of performance measurement data, as it offers accurate real-time information making reliance solely upon vehicle probe data a thing of the past. In cooperation with any iCITE Ready® data analytics partner, the DA-400x™ easily interfaces with any make or model of traffic cabinet or controller (NEMA, ATC, or Type 33X), giving users access to turning movement counts, amber/red actuations, arrivals on red, detector failures, preemption details, communications and power failures/alerts, split and interval timing data, and the Purdue Coordination Diagram, based upon high resolution data – all tailored to provide automated traffic signal performance measures via a Cloud-based user-friendly interface. If your agency, business or academic institution needs access to accurate performance measurement data, please stop by booth A07 at the IRF R2T Conference & Expo to learn more about how you will benefit from our innovative traffic control solution – the iCITE® Data Aggregator DA-400x™.